Outdoor space on the Georgia Tech campus includes selected lawns, walkways, amphitheaters, sidewalks, courtyards, and parking decks. 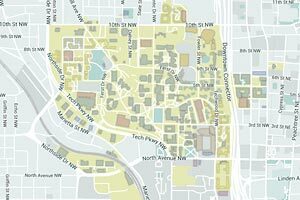 These areas may be scheduled by chartered student organizations and GT schools and departments. They may be reserved through the GT Events Reservation Website. Groups that reserve outdoor space for their events are responsible for cleaning up the area at the close of the event. All displays, tables, and exhibits must be removed from the area once the event has ended. Trash cans may be obtained by emailing cheryl.taylor@facilities.gatech.edu. To obtain free recycling containers contact the GT Recycling Office. Please see the Guidelines for Use of Outdoor Space located in the Resources box on this site for more information on the use of outdoor space on campus. Individuals who are not members of the Georgia Tech community are not permitted to use outdoor space on campus for advertising or sales. They may use outdoor space as outlined in the Campus Space Use Procedures. Banners can be hung on the second floor of the Student Center building. To reserve banner space please click on "Reserve Space (GT EVENTS)" in the Resources box on the right side of this page. With prior permission, water soluble chalking is allowed on campus sidewalks only. Chalking must be at least 20 feet from all entrances and not placed under any overhead obstruction or on stairways. Chartered student organizations, schools, and departments may chalk to advertise events. Do not use chalk-spray, markers, or paint. To obtain permission to chalk on campus sidewalks please send an email inquiry to events@spaceplan.gatech.edu. Amplified sound may be used outside buildings only if approved in advance by CPSM. Amplified sound may be approved Monday through Friday only during the protected hours for faculty and staff meetings, currently on Tuesday and Thursday from 10:45 a.m. to 11:45 a.m. in accordance with the Registrar's Standard Class Meeting Times (https://registrar.gatech.edu/info/standard-class-meeting-times-fall-and-spring-semesters), or after 5:00 p.m., and on weekends. Authorization may not be granted or will be withdrawn if the amplified sound interferes with regularly scheduled classes or other educational functions, or with other scheduled events.